As soon as you see it, you realise that the IMPRESSA Z9 is setting new standards. And it is doing this on multiple levels thanks to its impressive coffee quality, user-friendly operation and captivating design. Made from high-quality materials and to Swiss standards of precision, this elegant automatic speciality coffee machine is the epitome of the strong and silent type. 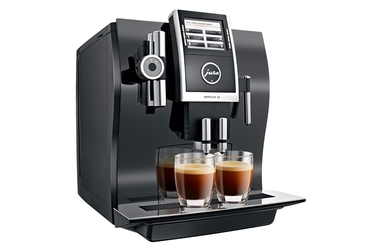 Once the desired option has been selected on the high-resolution TFT colour display, the machine silently sets about preparing an espresso, coffee, latte macchiato, cappuccino or other speciality. The cup illumination feature ensures that the final result is always presented in the best possible light. This turns any speciality coffee into a treat to tantalise all the senses. State-of-the-art technology is all about creating a true and authentic result. The Aroma+ grinder can grind fresh coffee beans twice as fast as conventional grinders while at the same time preserving all their delicious aroma. There are two thermo-blocks (one for coffee and hot water and another for steam) to ensure optimum preparation conditions. The Rotary Switch and TFT colour display ensure intuitive operation. Six products can be individually arranged and labelled on the screen. Together with the ability to select 11 specialities with the Rotary Selection control, this means that you can create any coffee you could possibly want in no time at all. And thanks to the coffee à la carte selection function, the range of options is almost unlimited, as it allows you to adjust the settings to suit current requirements in a flash. Latte macchiato, cappuccino and other specialities are extremely popular all around the world. Featuring fine foam technology, the IMPRESSA Z9 is able to produce milk foam with a fine, feather-light consistency that is the crowning glory of any of these trend specialities. Thanks to the way the cappuccino spout can be adjusted up to a height of 153 mm, even large latte macchiato glasses can be accommodated with ease. The unmistakable design combines purest luxury, elegance and sophistication. The striking lines reflect the shape of the coffee bean. The high-quality materials used are produced with maximum precision and outstanding craftsmanship.